In all sports there are individuals who, through their accomplishments, change the sport’s landscape and set the bar for others to follow very high. In the early 1970’s, Dahlia would travel from her French home after achieving success in some very prestigious races to North America, and capture important races on the western continent. Her successes opened the flood gates for many of the top European runners to follow her lead. Racing on an international basis had been attempted before Dahlia’s western excursions, with some success, but not to the level in which she would attain. With the introduction of the Washington D.C. International at Laurel Racecourse in Maryland in 1952, track owner John Shapiro set up an event to attract top horses from around the world. His goal was to create a world championship race, for entrants to compete on his infield turf course at the long established distance of one and one-half miles. The race became an immediate hit with race fans and horsemen. However, at this point in time, the D.C. International was the only race of its kind and was run in November, at the end of a long season. Many of the top horses did not come due to the timing and singularity. Belmont and Woodbine would step to the plate and follow the lead of Shapiro, adapting existing races run at these tracks, and thus made the Man O’ War Stakes (Belmont) and the Canadian International (Woodbine) as similar events to be run prior to the Laurel race. In essence, a series had been developed. The series was in its infancy when a chestnut filly by Vaguely Noble – Charming Alibi by Honey’s Alibi was sent over from France by her trainer Maurice Zilber, to tackle the trifector. Her name was Dahlia and her success in the races, set in motion a path for other top Europeans to come to North America and attempt to win the lucrative events. So who was this trailblazing world traveller and why did she become one of the most revered mares of the twentieth century? Dahlia was bred in 1970 by Nelson Bunker Hunt. She was foaled and raised at Claiborne Farm in Kentucky. Her dam Charming Alibi won sixteen of seventy-one starts with four of her wins coming in stakes races. Her biggest score in victory was the Dominion Day Handicap at Woodbine. Charming Alibi not only produced Dahlia by Vaguely Noble, but also Captain General (Sam Marino Handicap) by the same sire. Charming Alibi is a direct descendant of Frizette (fourth generation). Vaguely Noble was a first class racer and sire. He defeated the great Sir Ivor in the Prix de l’Arc de Triomphe and added wins in the Prix du Lys, Prix de Chantilly, Prix de Guiche and as a two year old the Observer Gold Cup. Vaguely Noble won six of nine races and never finished off the board, achieving a 140 lbs rating from Timeform. At stud he was just as successful getting not only Dahlia but also Empery (Epsom Derby), Exceller (Canadian International, Jockey Club Gold Cup, Grand Prix de Paris and eight other G1 races), Estrapade (Champion in North America), Lemhi Gold (Champion in North America), Gay Mecene (Champion in France), Mississippian (French two year old Champion), Noble Decree (English two year old Champion) and Ace Of Aces (Sussex Stakes). Vaguely Noble led the England/Ireland sire list twice and the broodmare sire list once. He sired seventy stakes winners and is the broodmare sire of another one hundred and seventy-five more stakes winners. Clearly Dahlia was a well bred miss. With the mating of her parents, Dahlia is inbred to Hyperion 4x4x5, as her dam sire was a grandson and her sire a great grandson of the legendary stallion. A third cross of Hyperion is in her pedigree in the fifth generation. Her sire is inbred to the great undefeated Triple Crown winner Bahram 4×4. Her pedigree oozes with speed and staying class. She would demonstrate her natural abilities for all to see on many occasions during her racing career. Dahlia made her first start in the Prix Yacowlef, a somewhat unique stakes race for first time starters, winning the five furlong dash at Deauville by two lengths. Lester Piggott was in the irons for this race. Dahlia led from wire to wire and Piggott told Maurice Zilber that she refused to rate so he just let her run. Zilber, a flamboyant trainer with an abundance of confidence but also very good horsemanship, took heed of Lester’s words and began to try to teach his obviously talented filly how to relax and conserve herself for longer races. However, Dahlia had her own idea as to how to race and resented being held back. She would make three more starts as a two year old, all with Piggott to guide her, and she finished fifth twice and second in her final start of the year. Put away for the winter, Zilber continued to work with Dahlia, trying to get her to conserve her energy and stretch out. April 8, 1973 would be the day of Dahlia’s return to the races where she won the one mile Prix de la Grotte at Longchamps. Piggott was not her jockey that day as Zilber engaged Bill Pyers, a strong rider with a good sense of pace. Pyers kept Dahlia well back in the race, unleashing her with two furlongs to go. Dahlia won the race by three quarters of a length. Next up for Dahlia was entry into the Poules d’Essai des Pouliches, or the French 2000 Guineas if you prefer, and her first encounter with another highly regarded three year old filly named Allez France. The race was run on soft ground, a footing Dahlia did not relish. Allez France won the classic two and a half lengths in front of Princess Arjumand, with Dahlia another neck behind that one in third. Dahlia redeemed herself three weeks later in the ten furlong group one Prix Saint-Alary, coming from seventh place with a brilliant turn of foot to win going away by one and one-half lengths. The Prix de Diane (French Oaks) was next up, and a re-encounter with Allez France. On a yielding course at Chantilly, Dahlia made a bold and determined effort to come from the middle of the pack, but Allez France had gotten the early jump and stayed ahead of Dahlia at the finish post. Zilber brought Dahlia to the Curragh for the Irish Oaks, and still with Pyers in the saddle, Dahlia ran a carbon copy of her Chantilly race to win by three clear lengths. The difference in this race was firmer footing and that she did not have to contend with Allez France. Now in top form and with a classic win on her resume, Dahlia was ready take a run at beating the boys. The King George VI and Queen Elizabeth Stakes is one of the richest and most prestigious weight for age races in the world. Dahlia would be not only facing males, but older males as well. She had raced against the boys before, but only those of her own age, and certainly not of the class and calibre entered for the big Ascot race. It would be a huge step up, but Zilber was confident, he certainly never lacked any of this trait, in Dahlia. The performance put in by Dahlia is the stuff of legends. Last as the field entered the short Ascot home stretch, Dahlia simply rocketed past a strong, deep and classy field to flash past the finish post six lengths in front of second place finisher Rheingold. That’s right, SIX LENGTHS. Rheingold later that year went on to win the Arc. Also in the field which Dahlia had destroyed on this day were Epsom Derby winner Roberto, French Derby winner Hard To Beat, Irish Derby winner Weaver’s Hall, and Eclipse Stakes winner Scottish Rifle. Dahlia had humbled some of the best males in training that day, and paid her backers at a handsome 10/1 odds for the win. The exuberant Zilber would cheekily say post race “I know how to make money at the races”. The British press was beside themselves with adulation for the new star filly and the performance she had just delivered. “Humiliation” was an often heard word given to the vanquished also rans in the King George. As written in the Breeder’s Bloodstock review, “This was no defeat for the males, it was humiliation. They were devoured by a three year old filly that bided her time at the back and then unleashed her devastating speed. Her performance at Ascot is one of the greatest displays of a Thoroughbred ever witnessed”. Dahlia went back to France and would next appear at Lonchamps for the eleven furlongs group three Prix Niel, again against mixed company. There would no longer be any bargain odds on her any more as the word was out, Dahlia is a superstar. She dutifully won the race by an easy length, as the odds on favourite. Maurice Zilber sent Dahlia to the post a fortnight later at Longchamps for the twelve furlongs Prix Vermeille, a group one race for fillies and mares. The ground was soft as was the pace, and Dahlia could not overcome both of these obstacles, nor her nemesis Allez France. Dahlia finished fifth, some six and one-half lengths in arrears. Returning to the paddock lame from a pulled leg muscle, Dahlia looked a beaten filly. The Arc was due to run in two weeks and Zilber and Hunt were hoping she could recover in time to compete. She did seem to recover and entered the starting gate for the Prix de l’Arc de Triomphe on a soggy October 5, 1973. Dahlia lost, and lost badly, finishing sixteenth of twenty-seven runners. Rheingold, who Dahlia had zoomed past at Ascot, won the race ahead of Allez France some nineteen lengths ahead of Dahlia. The course was listed as yielding, though many say that listing was an understatement. Now even though Dahlia had competed in nine tough races already in 1973, her connections thought she might have one more good race left in her tank before the year was through. Hunt dearly wanted to enter the Washington D.C. International at Laurel in six weeks time. Zilber was keen as well and he prepared Dahlia for the race. The Laurel course came up yielding on the day of the D.C. International. In the field was old rival Scottish Rifle as well as American grass specialists Tentam, Big Spruce and London Company. The latter led the field for the first seven furlongs until Tentam took over. Big Spruce and Scottish Rifle loomed to his outside while Dahlia, relaxed and running well saving ground began to move between horses to mount her charge. The course conditions did not hamper Dahlia on this day as she took off after the leaders under Bill Pyers and drew away impressively to win the D.C. by three and one-quarter lengths. Dahlia had made it all the way back to her scintillating form she displayed earlier in the year. She was voted as the top three year old filly in England and Ireland and was also named as the English Horse of the Year. Hunt and Zilber announced that the champion would be returning for another campaign in 1974. Her four year old season may have been even better, although it did not start off very well. Dahlia lost her first three races, two off the board finishes at Longchamps where Allez France won both, and a third in the Coronation Cup at Epsom. Zilber decided to switch to jockey Yves St. Martin for the Grand Prix de Saint-Cloud. Carrying 129 lbs, Dahlia won the group one race in her typical driving fashion, but only by a neck. A return to Ascot was next and a chance to defend her King George VI and Queen Elizabeth Stakes title. Lester Piggott was back as her pilot for this race and she returned to her glory with a powerful two and one-half victory over the Queen’s outstanding Prix de Diane winner Highclere. Dahlia became the first horse to win this prestigious race in back to back years. She was back and she had more to prove. 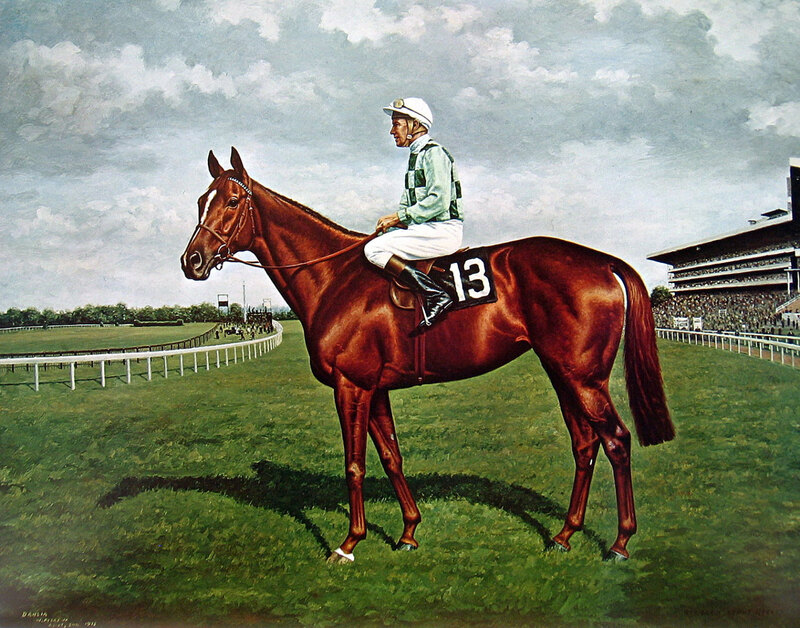 After another clear victory in the Benson & Hedges Gold Cup at York over Imperial Prince and the year’s Derby winner Snow Knight, Dahlia would have a hiccup in the group three Prix de Prince d’Orange, having been the victim of a very slow pace. She came with a rush in her usual manner but missed by half a length. The original plan was to try the Arc again, but after further review, Hunt and Zilber decided to come back to North America and compete in the rich turf races on offer. First up would be the Man O’ War Stakes at Belmont. The race was a grade one grass event covering twelve furlongs. Piggott could not come over so Ronnie Turcotte was enlisted. Dahlia won with plenty to spare by two lengths. The Canadian International at Woodbine was up next in fifteen days time. Piggott was back for this race. The race in the previous year had been the swansong event of the great Secretariat, and now here came a brash filly with a lightning quick closing kick to further the credentials of this very important race. London Company, Big Spruce and Snow Knight were all there to challenge Dahlia, but to no avail. Piggott saved ground with her and then in a move reminiscent of her winning move the previous year in the D.C. International, Dahlia came between horses to shoot though in the stretch to take command of the race and won by length over Big Spruce. Thirteen days later at Laurel she faced a fresh set of challengers and although she ran gamely, she could not catch Admetus and Desert Vixen. Dahlia was one and one-half lengths behind the winner. Her performances in the three races in North America were good enough to earn Dahlia the Eclipse Award as champion turf horse for the year. This award was in addition to her second consecutive Horse of the Year title in England. Dahlia raced for two more seasons, but unfortunately for her army of fans, she was just a shadow of her glorious self. She had made twenty-four starts in her first three racing seasons, winning twelve and finishing in the money six times further. In her last two racing seasons she made twenty-four starts, but won only three races. She did not seem as interested in racing in those two years but did pop up with a blast from the past performance in the Benson & Hedges Gold Cup, thus defending her title, and in the Hollywood Gold Cup during her final racing year. Her final year was under the watch of Hall of Fame trainer Charlie Whittingham, who described her as a wonderful mare, very sweet to be around but stubborn when she did not want to do what was asked. Willie Shoemaker piloted her for most of her six year old season and said she was always game but just did not have anything left to compete. Dahlia was retired to Nelson Bunker Hunt’s Bluegrass Farm in 1977. Dahlia became an excellent broodmare, producing six graded stakes winners. Four of those stakes winners won grade/group one races while the other two won grade/group two races. She lived predominantly at Hunt’s Bluegrass Farm in Kentucky, but also had extended stays at Claiborne in Kentucky and Windfields in Maryland when bred to stallions at those breeding centres. Her most accomplished offspring was Dahar by Lyphard. Dahar won four G1 races (Prix Lupin, Century Handicap, San Juan Capistrano Handicap, San Luis Rey Stakes) and was second twice in the Hollywood Invitational and third in the Irish Derby. Dahar sired twenty-six stakes winners during his nomadic stud career in Kentucky, Japan, New Zealand and Australia. His best son was Buckhar (Washington D.C. Mile). Rivlia by Riverman won three G1 races, the Hollywood Invitational, Carlton F. Burke Handicap and the San Luis Rey Stakes. He was not a success at stud however. Delegant by Grey Dawn II won the San Juan Capistrano Handicap, and Dahlia’s Dreamer by Theatrical won the Flower Bowl Handicap to round out Dahlia’s G1 stakes winning progeny. Llandaff by Lyphard won the G2 Jersey Derby, and Wajd by Northern Dancer won the G2 Grand Prix d’Evry. Wajd is the dam of St. Leger Stakes winner Nedawi, Cumberland Lodge Stakes winner Wall Street, and of Grosser Preis von German Tote winner Fitful Skies. Wajd is also the dam of Nabati, the dam of Newmarket Stakes winner Best of Times, as well as Whist who produced Trick Taker, the dam of multi Australian stakes winner Brilliant Light and group one WAIKRC International Stakes winner Mission Critical. Two more daughters of Dahlia to pass on the stakes winning lineage are Dahlia’s Image by Lyphard and Miss Dahlia by Strawberry Road. Dahlia’s Image produced Dahlia’s Krissy, the dam of Ascot Gold Cup winner Rite Of Passage. Miss Dahlia produced Capital Plan, winner of the Santa Barbara Handicap and Beverly Hills Handicap. Dahlia was a refined filly with a very friendly easy going manner. She had her days when she refused to obey her rider and despised running on soft ground. She could be stubborn, but never in a savage or demonstrative way. She was especially kind and sweet around children and as a mother she was very caring and doted on her offspring. And of course, Dahlia was a very fast and tough competitor. In 1988 Nelson Bunker Hunt sold his entire Thoroughbred holdings, which was very substantial. Dahlia was part of the biggest dispersal in history. Five hundred and eighty Thoroughbred horses owned for racing and breeding were sold at the Hunt dispersal. Dahlia sold for $1.1 million to Allen Paulsen. The mare was eighteen at the time and not in foal, but Paulsen would benefit from purchasing Dahlia when she produced Dahlia’s Dreamer and Llandaff for his Brookside Farm operation. When Paulsen passed away, Dahlia stayed on the farm after it became known as Diamond A Farm. She was pensioned from stud duty in 1996 and would live another five years until her passing in 2001 at the age of thirty-one. Dahlia is buried at Diamond A.
Dahlia was one of the most intriguing Thoroughbreds in history. She won G1 stakes races in five countries, thus bringing the racing world into a new era of world travel and give racing fans a chance to see champions from other racing jurisdictions compete. She paved the way for the likes of Youth, Exceller, Snow Knight, All Along, Singspiel, Champs Elysees, Strawberry Road, Pebbles, Miesque, Ouija Board and many more to make transcontinental trips a fashionable way to compete in world Class G1 races. In 1981 Dahlia was inducted into the US National Racing Hall of Fame. When she retired from racing she was the leading money earning female in racing history. The Blood-Horse named her as the fifth best female, and fiftieth best horse overall in their top 100 horses of the twentieth century poll. She was twice named as the high weighted filly or mare in the US. In Canada she received a 130 lbs rating. In England, Timeform rated her at 135 lbs. She produced six stakes winners. That is quite a life’s work by one mare. The only thing Dahlia could not do was beat Allez France, but then again not many could, male or female. Dahlia in my opinion was the trailblazer for the European racing invasion to North American shores, and started the onslaught. Her sweet and almost jovial personality made it all the more easier to fall in love with her. Dahlia was a Queen of the Turf in every way possible. Thank you for this biography of Dahlia. I remembered most of the races described, most of all the International. I knew Nelson Bunker Hunt in a business way, and he really loved the thoroughbred world, and was glad he was able to breed Dahlia and be successful for her. To me Dahlia represents what an outstanding filly is, because she had a strong personality, a great racing form, and able to produce really good race horses, and horses that have continued in pedigrees today, if people look far enough back. When she was older and the farm sold, I was very glad she was able to stay on the farm and live her days where she was comfortable; people did a lot of that back then, but do not hear of this occurring today. Truly sad.. When people with money dedicate to owning thoroughbreds they should also see that these horses are cared for and placed on a farm until they die. Most of the people who own these farms are very wealthy. Money To care for a horse retired should be peanuts for them. I so enjoyed reading this story of Dahlia. So touching and beautifully written!